My 16-year-old and I recently enjoyed a very 21st century mother-daughter outing: we made a pilgrimage to the Apple store to purchase the new iPhone 4S. (Each of us was using a phone with a screen so shattered it routinely imparted glass splinters.) Naturally, I was irritated even before we got to the mall. We’d had to go online the night before–at exactly 9 pm–to reserve the phones for in-store pick-up the following day, which I found a little cloying. Why not just deliver the phones to the store and then sell them on a first come, first served basis? Plus we only had a little over an hour before my daughter had to get back to school. The short line snaking between barricades outside the Apple store did nothing to ease my agitation. An assortment of unhurried looking customers of all ages calmly texted or played “Angry Birds” while they waited for a blue-shirted savior to call them. “Go see if we have to wait in this line!” I instructed my daughter in a stage whisper. She approached one of the blue shirts, who checked his iPad and talked into his pretentious little earpiece before sending her back with an affirmative nod. Everyone in line had “reserved” a new iPhone the night before. Now, I love Apple products, but the Apple store itself makes me queasy: the “Genius Bar,” the squishy little ball seats pulled up invitingly to the sample products displayed on uncluttered blonde-wood tables, the geeky-chic employees sporting all manner of tattoos, piercings and horned-rim glasses–it’s all a bit too precious and artificially nonchalant. Maybe I’d feel differently if they provided free drop-off babysitting service. Or maybe I’m simply the modern-day equivalent of an immigrant arriving at Ellis Island: an anxious and exhausted stranger navigating an alien but promising new land. As soon as the blue-shirt called us–and it was soon–it became clear that I am not the hip multimedia-savvy, techhie mom I imagine myself to be, but a visitor from the Old World dependent on my bi-cultural young daughter for translation. “Mom, give him your old iPhone,” she said slowly, as if speaking to a deaf and batty old aunt. 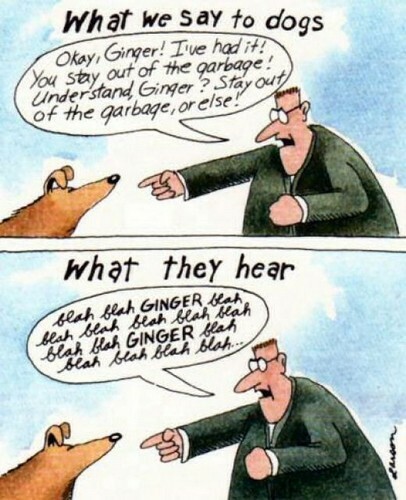 Then they exchanged a lot of words and numbers I didn’t understand: “32 gig… OS 5… the cloud… 8 megapixels… Apple ID… GMS…” I felt a little like the dog in the old Gary Larson cartoon, who comprehends only her name–“blah blah blah Ginger”–when her owner speaks to her: “blah blah Mom blah blah iPhone.” I tuned out and watched someone’s impossibly happy photos dissolve into one another on the iPad display. “Mom!” I heard my name again. “Your credit card?” Now that I understood. My daughter clutched two elegant little boxes–far more alluring than the proverbial blue ones from Tiffany. Not surprisingly, the digital native had her phone loaded, running and sending voice-activated text messages by the time we got home. Mine? Well, it’s a process. This entry was posted in Family life, Kids, Parenting, Teenagers and tagged Apple Store, digital native, iPhone, technology. Bookmark the permalink. Funny and scary. My kids are 8 and 6 and go to a technology school where they are quickly learning more than I will ever know about the tech world. Soon I will have to go to them for help! 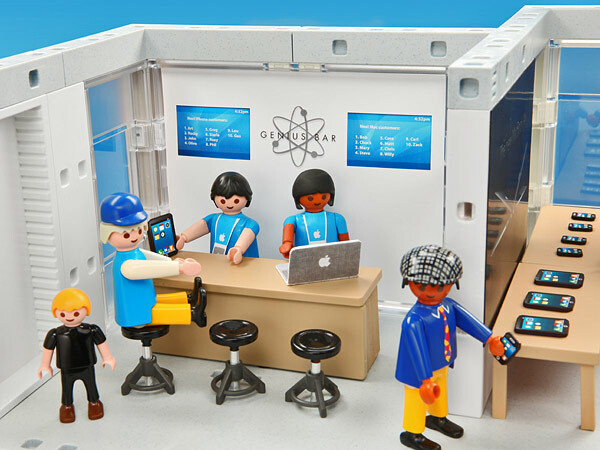 I love the Playmobil. It’s what caught my eye. My kids play with it every day and I used it for my blog’s masthead. Genius bar…genius! Neither of course!!! It’s a completely fictitious figure. I have no idea; ask your granddaughter! Sony walkmen, from letter writing to email, from playing sports to step aerobics and from stovetop to microwave. In a funny sort of way, the new iphone is back to basics since it’s best feature is just plain talking. It doesn’t get much easier than that. HILARIOUS SUE! In fact JUST YESTERDAY Linda and I were running and chatting about how we are not going to be left behing on this information superhighway! 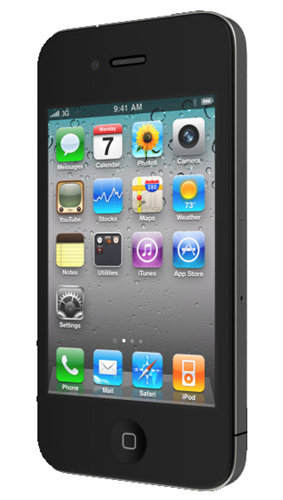 In fact, she vowed to get a iphone 45,(i have one already) AND an ipad! woot woot! And the other day when I was talking to another mid 40ish mom about facebooking, the two 15 year olds looked at us and one said, “I love when old people talk about facebook.” As if they were commenting on a Norman Rockwell quaint painting. Now…if I were only techie enough to see if I can actually LEAVE this comment…. Did you know that the “blue shirts” are taught never to correct a customer who mispronounces the name of a product?? I read that recently… and I believe it! Much better to just bring along a teenaged translator (and a credit card) and avoid the humiliation. Nice post, Sue! Boy do I know the feeling. I’ll take the blue Tiffany box. So yesterday I hired a new assistant named Siri and I tell ya–I’m in love (says this elated new iPhone 4s owner who’s nonetheless booked a still much-needed apple training session for this afternoon. I mean what is this cloud thing anyway? ).